As so many food bloggers know, it can be difficult to take photos of food. You have to arrange your subject on the plate. You have to have decent lighting. You have to have a plesantly contrastive backdrop. You have to keep your pets away. Head over to eat stuff to see other people’s cats. Thanks, Clare, for giving me an excuse to post this photo. One other site of interest is Stuff on My Cat, hosting a collection of cats with stuff on them. And, no, I didn’t let him eat the pie. Nic, that is so cute and so true! Mine wanted to eat my salmon sushi for IMBB that day. Hah! I had to move my comet truffle to an upper shelf because Audrey’s so used to just walking all over the counter. Our kitty is always following my around in the kitchen just waiting for something to drop! boo_licious – My cat would have been at sushi too quickly to get a shot like this! Mrs d – With all the pretty sugar work, she might have thought it was a toy! Piggy – I did move it after this shot. He walked around it a bit before he moved in, but he was moving very slowly, so I wasn’t too concerned that he’d get a bite before I could move the plate. I was suprised that he didn’t try to paw at it to see what it was. 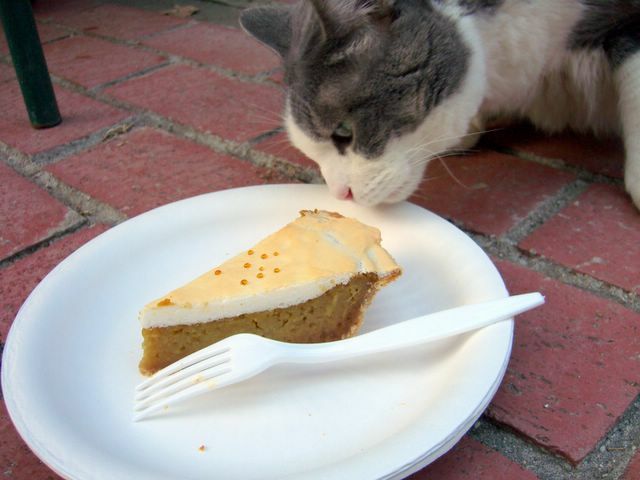 He definately seemed to be more attracted to the crust than the filling, though. Great photo! And so perfect for Weekend Cat Blogging! Templar – Thanks. He thinks he’s cute, too. Farmgirl – It is a food blog, so I had to sneak some in with my kitty. Nic, he is a beautiful cat – do you mind if I ask you his name? Thanks Keiko. His name is Dusty. Your comment makes me smile because, while I agree, he is really quite fat and rather ungraceful. He spends a lot of time rolling about looking more goofy than pretty. I think he feels falttered by your compliment, though.